Home Charity action 2018: Click and donate. Turn the big wheel and get a wave! You wouldn't believe the smell here in the office - a mix of Glühwein and roasted-almonds mixed cinnamon and BBQ. The Christmas market in Bonn has opened for business and that means we are, once again, starting our Christmas charity action. This year, we're celebrating another birthday too! One birthday, many new features. 2018 has been a very important year for us because the Visibility Index had its 10th birthday. We’ve also added 12 new countries (with Canada and Australia added just this last week) and are happy to announce, for the first time here, that we’re adding Russia and Mexico to our Toolbox very soon. There’s more! We’ve extended the functionality of our link module, we’ve added a daily visibility index, daily keyword position graphing, a URL changes tool, and produced some excellent SEO Talks info-videos with top experts. We’ve created the page-speed check-and-compare tool and the insightful, especially for youth-oriented and trending-keywords, Instagram hashtag generator. You can find out about all the major updates in our changelog but first we want to tell you about something else. You might have seen this in previous years as we start up the big-wheel, turn on the cameras and start our charity action. This year, because of the 10-year anniversary, we’re doubling our donation target from 5000 Euro to 10000 Euro. But we need your help. You click, we wave and donate! 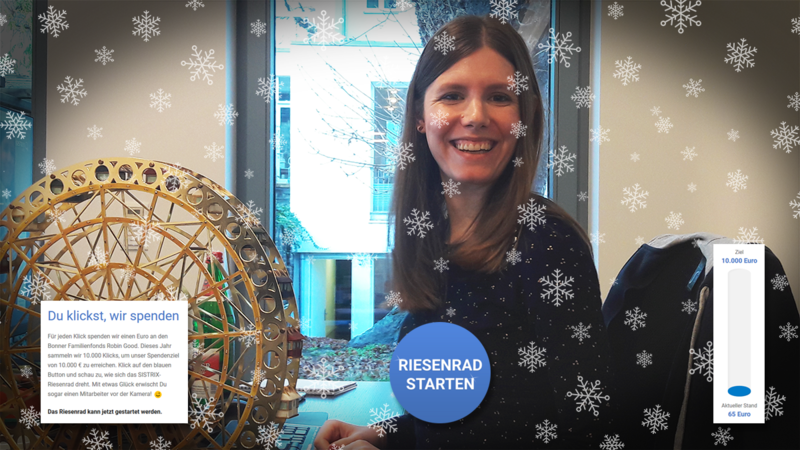 Go to https://www.sistrix.com/xmas/ to see a member of our team and the big-wheel, live. Click the button to turn the wheel and get a wave! Every time you click, we donate 1 Euro until we’ve reached our target of 10,000 Euro. We’ve got 24 days to do it! The beneficiary of the charity action this year is the local Robin Good organisation, a family-focused charity that aims to bring help to children of all genders, races and religions, quickly and efficiently. A real-time counter keeps track of our progress. Check in regularly to see how we’re doing, and to click-to-help! Wishing you all, around the world, a wonderful time over the Christmas holiday period.